After reading the No. 350 issue, the most impressive article for me was the article about the May 18 Democratization Movement in Gwangju. I have lived in Gwangju since I was born and my parents went through the incident, so I heard and learned a lot. I think the main culprit, Chun Doo-hwan still has not been properly punished. That is a great shame to the heroes of those days and to ourselves. However, fortunately, the answers of the international students were very hopeful and thankful. I never thought that foreigners were interested in the accident and foreigners in Gwangju would be proud of the democratization movement as they are in the same place. I think the fact that more people are interested and remember the incident is a great hope. Like the conclusion of the article, we should acknowledge the agony of our history and learn from it. “Those who do not know history are doomed to repeat it.” Other articles were also great. Through the No. 350 issue, I obtained lots of useful information. Actually, this is my first experience reading the magazine. I felt the editors’ efforts to make it. I thought all the articles were really well written. It provides us useful information at CNU. 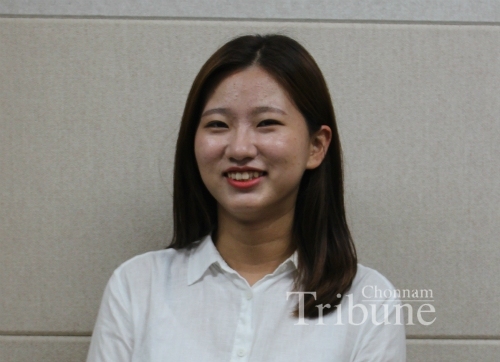 I will definitely recommend the Chonnam Tribune to my friends.